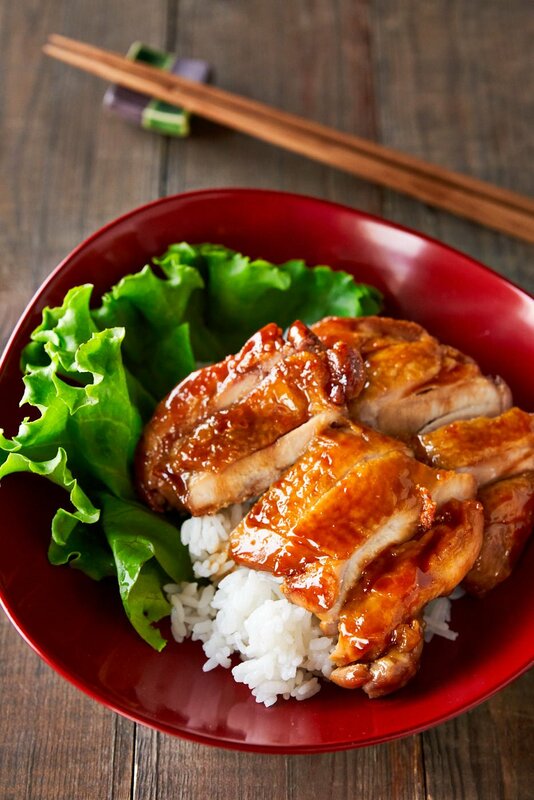 With juicy tender pieces of chicken glazed in a sweet and savory teriyaki sauce, this authentic Japanese Teriyaki Chicken recipe comes together in just eight minutes using four basic ingredients. Lately, I’ve been seeing a lot of recipes claiming to be “authentic” chicken teriyaki yet many of them seem to miss the whole point of the dish. So here it is, the definitive chicken teriyaki recipe written by a Japanese guy. 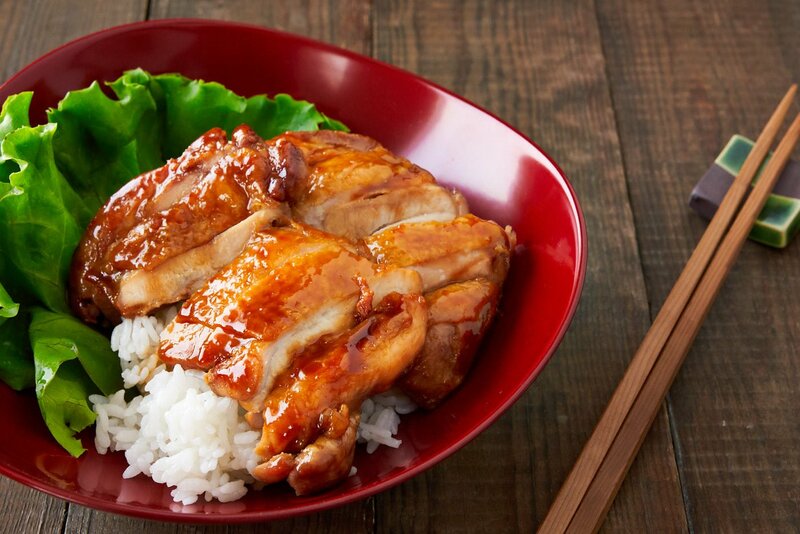 This may sound like an obvious question, but to understand what Teriyaki chicken (照り焼きチキン) is about, it helps to know what the name means. Teri (照り) is Japanese for shiny or lustrous while yaki means grilled or griddled (I’ll explain more about this later). 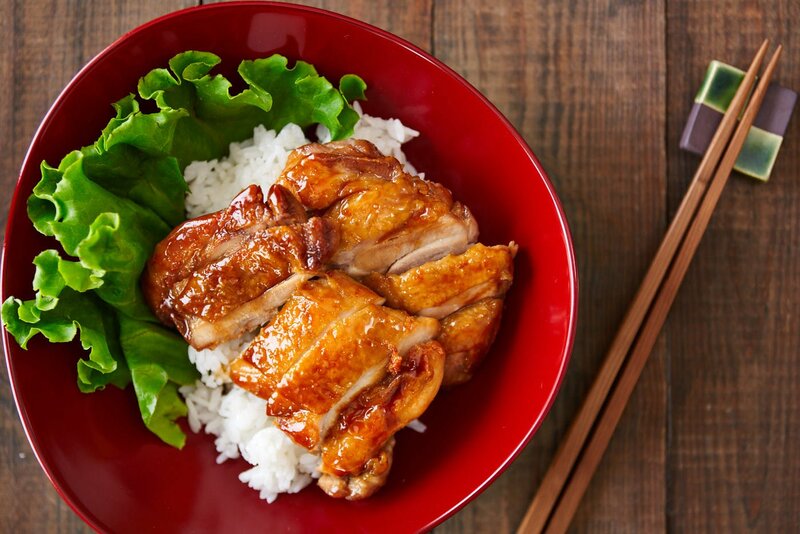 Translated literally, the name means “shiny grilled chicken”, and it refers to the clear lacquer-like glaze that’s created when the sugars in the teriyaki sauce caramelize. Although the name “Teriyaki” is relatively recent nomenclature, the practice of cooking meat and fish in a mixture of soy sauce and sugar has been around for hundreds of years, going by names such as Amakarayaki (甘辛焼き, sweet and salty grilled) Kannroni (甘露煮, literally simmered in sweet nectar), and Yamatoni (大和煮, simmered Yamato-style). Soy Sauce – This is the most obvious ingredient and is what gives teriyaki sauce its coffee black color and savory taste. There’s no need to get fancy here, but just be sure you’re using Japanese soy sauce. I have a whole collection of wonderful soy sauces from other countries, but they all have a different taste and salinity and are not suitable for making Teriyaki. Sugar – The sugar is what balances out the saltiness of soy sauce, giving teriyaki sauce its divine balance of sweet and savory. As the liquid reduces, the sugar caramelizes, imbuing the sauce with its trademark flavor while also thickening it. This allows the sauce to glaze whatever food you put it on in a shiny shellac of flavor.I like using evaporated cane juice (a.k.a. raw sugar) because it contributes a bit more flavor to the sauce, but plain old white sugar will work too. If you want to get an even shinier teriyaki chicken, try replacing some of the sugar with rice maltose. It’s a type of liquid sugar that’s made by saccharifying the starches in rice. It’s extremely viscous (like cold honey) and shines like an amorphous crystal ball. For this recipe I’ve left it out to keep it simple, but if you can get your hands on it, it’s definitely worth using. Sake – Sake, is an alcoholic beverage made from rice by first saccharifying the starches in rice using koji, a type of filamentous fungus. The sugars are then fermented into alcohol by yeast. The reason for adding the sake isn’t for the alcohol, but for the amino acids produced during fermentation. These amino acids stimulate the umami taste receptors in your mouth giving the teriyaki sauce its lip-smacking savory taste (without adding any MSG).When choosing sake, you don’t need to use anything expensive, but please don’t use “cooking sake”. Although it may sound counterintuitive, cooking wines (yes this applies to grape based wines too) are made with very low-quality alcohol and are loaded with salt, flavorings, and other additives that will throw off the recipe. It’s also worth noting that the alcohol in the sake (as well as the soy sauce… yes soy sauce naturally contains some alcohol) will burn off as you reduce the sauce, so it’s safe for kids to eat. If you have other reasons for not wanting to use sake, you can substitute water. It obviously won’t taste the same, but there are no good non-alcoholic alternatives (no, rice wine vinegar is not a good alternative… see my explanation below). I know there are probably a few of you asking “What about mirin?”. Mirin is a sweet alcoholic beverage made in a similar fashion to sake and then aged. It’s traditionally added to teriyaki sauce to boost the umami and shine in the sauce. The problem is that real mirin is hard to find, even in Japan. Most “mirin” is just grain alcohol with corn syrup, colorings, and flavorings. That’s why I prefer making the sauce with real brewed sake and sugar. Most teriyaki sauce recipes include a lot more than 3 ingredients. Here are a few examples and why I don’t recommend using them. Garlic, Ginger, Scallions – All of these things add particulate matter to your sauce. If you must embellish your teriyaki sauce with an aromatic, you can grate and strain these ingredients through a sieve to extract their juice. This will allow you to add the flavor without blunting the sheen of the sauce. Another idea is to simply garnish your finished chicken teriyaki with grated ginger or chopped scallions. Sesame seeds or oil – You’re welcome to garnish your teriyaki with toasted sesame seeds at the end, but adding sesame oil to teriyaki sauce makes it a different dish. Vinegar – recently I’ve seen some recipes suggesting you can replace the sake in teriyaki sauce with vinegar. While rice vinegar can be made from sake (just as red wine vinegar can be made from wine), it undergoes chemical changes in the fermentation process, and the two taste nothing alike. If you really want to add rice vinegar to your sauce, there’s a delicious Filipino dish called Chicken Adobo. Starch – Teriyaki sauce gets its thickness from the sugars in the sauce being reduced and caramelized. If you’re getting the proper level of caramelization in your sauce, there’s no need to add a thickener. Juices – I occasionally see a teriyaki recipe that includes pineapple or apple juice. I’m not sure if this is due to some misguided notion that fruit juice is healthier than sugar or if the creator enjoys the taste of the fruit in the sauce, but teriyaki sauce does not traditionally include juice. That being said, as long as the juice is filtered and doesn’t include any pulp, you can still get a good teri from your sauce by adding juice. Another idea is that you can also just cut up some fresh fruit and toss it in at the end as you caramelize the sauce. I usually mix the ingredients for the sauce straight into the pan, but if you want to save even more time, you can premix a large quantity of soy sauce, sugar, and sake in equal parts and stir it until the sugar is dissolved (heat it if need be). Then you can put your homemade teriyaki sauce in a glass bottle and store it in the fridge where it will keep for months. The traditional cut of chicken for teriyaki is boneless skin-on chicken legs (both the thigh and the drumstick). If you can’t find whole legs where you are, skin-on chicken thighs will work just fine. When made properly, the fat renders out and the skin crisps, while keeping the meat tender and moist. If you really hate having skin on your chicken, you can remove it after you’ve browned the chicken, but before you add the sauce. As for chicken breasts, it’s worth mentioning that teriyaki chicken is not traditionally made with white meat. That being said, if you prefer it, then there’s nothing wrong with using it. Just be aware that breast meat is much leaner than thigh meat, which makes it susceptible to drying out. My recommendation would be to pan-fry it until it’s just barely cooked through and then transfer it to a plate while you caramelize the sauce. Once the sauce is nice and thick, you can add the breast back in to glaze it. To get the most flavor into your teriyaki chicken, it’s important to get it nice and brown on the outside. In order to do this, you have to get rid of the moisture on the surface of the chicken before it will brown. Normally this would involve frying the chicken until the surface moisture has evaporated, but doing this will render the meat overcooked and dry. To get around this, I like to lightly salt the chicken, before pan-frying it. This coaxes out any excess moisture from the surface, and then you can use paper towels to remove the liquid, along with the salt before frying it. Yaki is usually translated as “grilled”, but it can also mean pan-fried (like on a griddle). I prefer making teriyaki in a pan as it gives more consistent results and is less work than grilling. 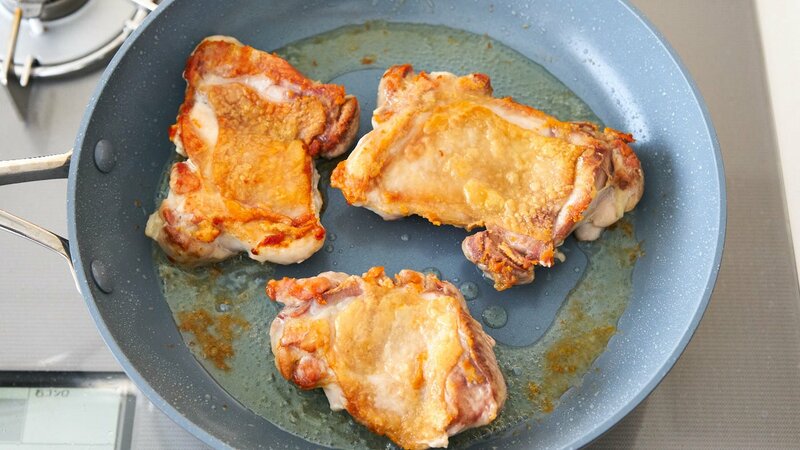 The method is simple; once the chicken is salted and patted dry, it’s placed skin-side down into a cold non-stick pan. There’s no need to add any oil since the skin will render out plenty of fat. The chicken is cooked slowly over medium heat until the skin side is crisp and browned. Then it’s flipped over to cook the meat through. Once the meat is cooked, you just need to drain off the fat and wipe out the pan before adding the ingredients for the sauce. Then the chicken is flipped over repeatedly to build up a nice shiny glaze. By the time it’s done, most of the sauce should be on the chicken, and anything remaining in the pan should be about the thickness of honey. If you do decide to grill your teriyaki chicken, here are a few tips. Combine the ingredients for the teriyaki sauce in a small pan and boil until thick and bubbly. For the chicken, follow the salting step and pat the chicken dry. Brush some neutral oil onto the chicken; this will help prevent the chicken from sticking to the grill. Grill the chicken until it’s almost completely cooked through and then brush the reduced teriyaki glaze on the chicken. You can flip the chicken over and reglaze a few times to get a beautiful glossy finish. As you may have guessed, you can use this teriyaki sauce recipe and method to make anything from beef teriyaki to salmon teriyaki. You’ll need to adjust cooking times depending on the type and thickness of the protein you choose. Just cook it until it’s a little shy of your desired doneness. Then you just add the ingredients for the sauce and caramelize them around the food, flipping it until it’s glazed in a shiny layer of sauce. Sprinkle both sides of the chicken evenly with the salt and set aside until the salt draws out some moisture from the chicken. Use paper towels to pat the chicken dry. Place the chicken skin-side down in a cold non-stick frying pan and turn the heat on to medium. 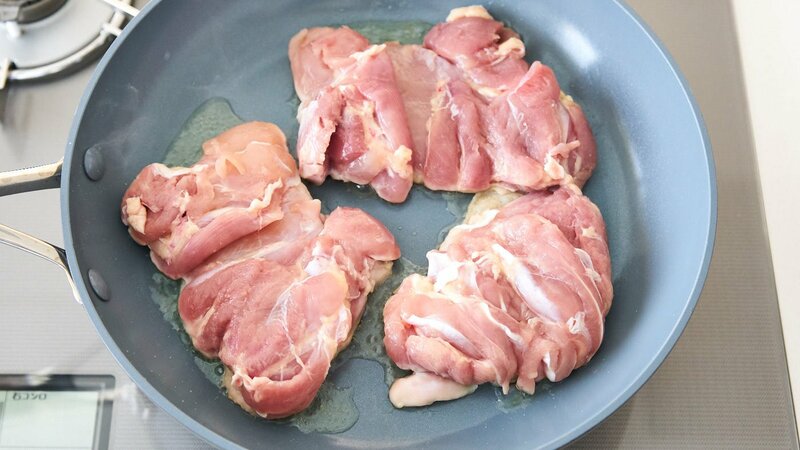 If you are using skinless chicken, you will need to add a bit of oil to the pan. Fry the chicken on one side until the skin is crisp and browned. 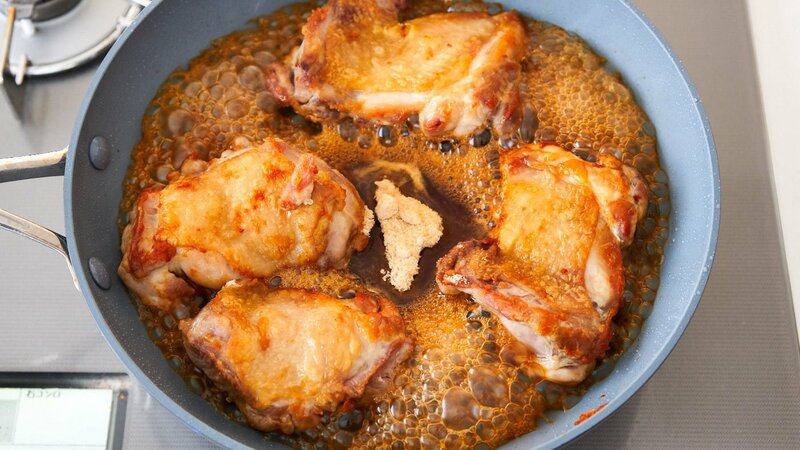 Flip the chicken over and continue frying until the chicken is almost cooked through. Drain off any excess oil and then use paper towels to wipe up any remaining oil. Add the soy sauce, sugar and sake and turn the heat up to high. 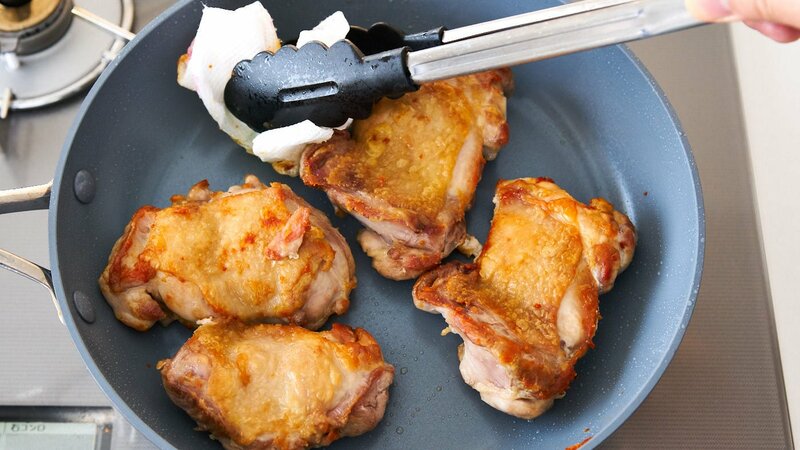 Use tongs to continuously flip the chicken to keep basting it with the teriyaki sauce. 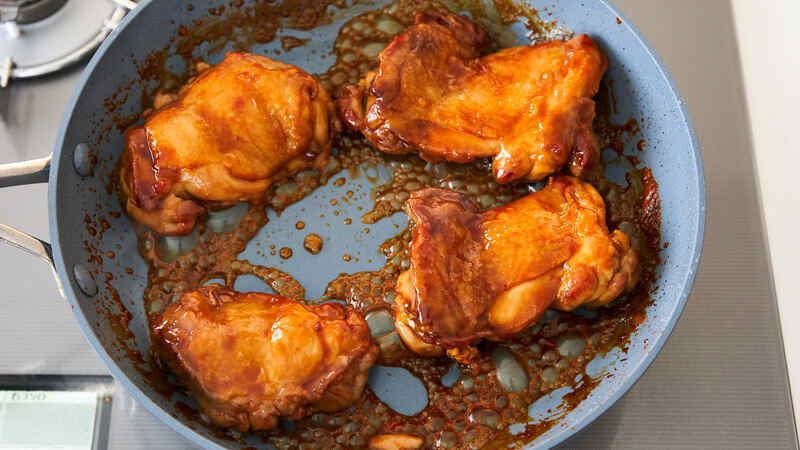 The chicken teriyaki is done when there is almost no liquid remaining in the pan, and the chicken is coated in a thick, shiny glaze. Hi Iane, we don’t put ginger or garlic in teriyaki sauce in Japan, though it’s a common addition in other countries. Hi Alicia, my sauce doesn’t use mirin. If you’re talking about the sake, please read the headnotes, I go into detail on why the sake is added along with alternatives. So, you marinade. The chicken as it is. Being fried? Can that be done beforehand in the frig in a bag? The chicken is not marinated, it is glazed with the sauce. 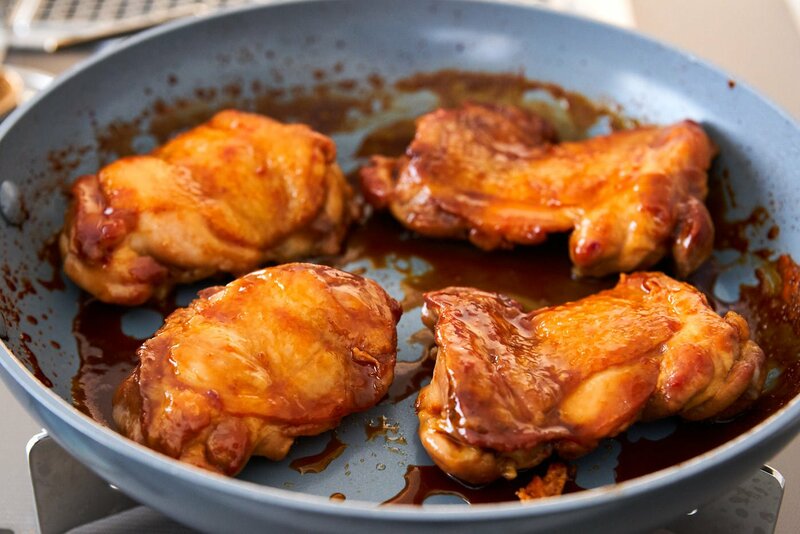 Teriyaki sauce has a high sugar content, so if you marinate it in advance, it tends to burn. I will try to cook this first, what kind of sake I will use. Give us the the name of sake. Hi Encar, there are literally thousands of brands of sake, so it’s impossible to name them all. Hakutsuru, Shochikubai and Gekkeikan are probably the most commonly available in the US. You can read my notes on the sake in the headnotes for more details on what to look for. I like to make a small jar of teriyaki so I have extra that I can splash on meats/veggies for a quick weeknight meal. The recipe I’ve used previously has mirin. I assume I can extend your recipe so I can have extra sauce to store, say 1/3 cup soy sauce, etc.? Hi Peter, you can add mirin, but I suggest, cutting back on the amount of sugar slightly. Hi Ilonka, if you go to a higher end supermarket with a butcher(like WholeFoods), or a butcher, you should be able to ask them to debone the thighs for you. Otherwise, you can debone them yourself. It’s not too difficult. You just need to make a slit on the meat side(opposite of the skin side) from one end of the bone to the other, then you just tug on the bone as you scrape the meat off with a knife.